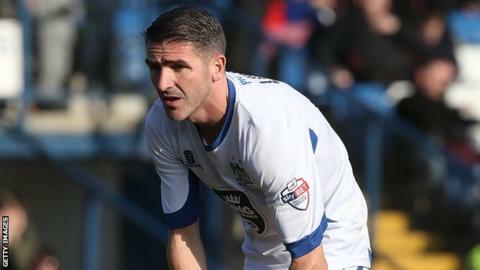 Ryan Lowe scored the only goal of the game against Portsmouth to help Bury maintain their hopes of automatic promotion to League One. The home side dominated the first half, with Jed Wallace twice testing Shakers keeper Nick Pope before the break. But Bury took the lead just before half-time, with striker Lowe meeting a Joe Riley cross to head home. Pompey failed to mount a comeback after the break and have now lost both games under caretaker boss Gary Waddock. Bury, who have a game in hand on all three sides above them in the automatic promotion places, remain in fourth spot and are just two points adrift of Wycombe Wanderers in third. "It's a difficult one because we played extremely well during the course of the first half and conceded late on. The second half, credit to Bury, they managed the game extremely well. "We have a number of injuries to key players and we have ended up losing a game. But really we couldn't have asked for anymore from the players today. "We should be challenging at the top end of this division. The club have to regroup in the summer. It's a fantastic group and a fantastic opportunity." "We ended up scoring a fantastically worked goal and Lowe's come up trumps with it. It was a brilliant header and when he shoots up like that, you just know he's sighted it and he's got quality to execute it. "I'm not into records, creating a future is about keep doing the right things all the time and we're trying to do that, but certainly when I look at the efforts from the lads and the discipline to get six clean sheets on the bounce that pleases me." Match ends, Portsmouth 0, Bury 1. Second Half ends, Portsmouth 0, Bury 1. Foul by Adam Webster (Portsmouth). Corner, Portsmouth. Conceded by Chris Hussey. Foul by Nigel Atangana (Portsmouth). Substitution, Portsmouth. Adam May replaces Ben Close. Substitution, Bury. Danny Rose replaces Danny Mayor. Attempt missed. Danny Hollands (Portsmouth) header from the centre of the box misses to the left. Adam Webster (Portsmouth) wins a free kick in the defensive half. Substitution, Bury. Chris Sedgwick replaces Kelvin Etuhu. Substitution, Portsmouth. Conor Chaplin replaces Matt Tubbs. Attempt missed. Craig Westcarr (Portsmouth) header from the left side of the box misses to the left. Substitution, Portsmouth. Johannes Ertl replaces Nyron Nosworthy because of an injury. Matt Tubbs (Portsmouth) wins a free kick on the left wing. Attempt missed. Danny Hollands (Portsmouth) right footed shot from outside the box is high and wide to the left. Attempt missed. Ryan Lowe (Bury) right footed shot from outside the box is just a bit too high from a direct free kick. Foul by Nyron Nosworthy (Portsmouth). Second Half begins Portsmouth 0, Bury 1. First Half ends, Portsmouth 0, Bury 1. Craig Westcarr (Portsmouth) wins a free kick in the defensive half. Goal! Portsmouth 0, Bury 1. Ryan Lowe (Bury) header from very close range to the bottom right corner. Assisted by Joe Riley.